A rivalry going back more than a century. (Let’s just peg it to the French colonization for, you know, fun.) A history steeped (simmered?) in deep working-class roots. Star anise. A shitload of onions. As the dust settled on Day 3 of Souper Bowl I, the nearly unthinkable had happened: Top-seeded Pho had gone down to colonial oppressor French Onion in the upset of the round — and maybe the entire tournament. What went wrong for the young upstart? First, let’s look at the no. 1 seed. Pho is a Vietnamese rice noodle soup, served with beef or chicken, in a (typically) clear beef broth flavored with star anise and cinnamon, and usually garnished with stuff like lime, cilantro, Asian basil, and bean sprouts. A good version will also contain some very rare beef, tripe, tendon, bone marrow, or some other kind of offal, which can have a polarizing effect when judged by the American palate. But, by any measure, this global powerhouse is a meal in a bowl — the kind of soup that gives you the strength you need to survive under the boot of Western oppression. French Onion, on the other hand, needs no introduction, if not for its ubiquity, then definitely for its matter-of-fact name. Onions, lots of them, caramelized, drowned in beef broth and cognac, and then topped with some combination of toast and melted cheese. 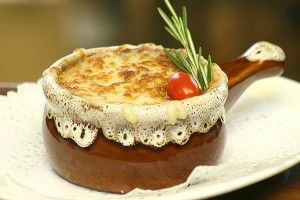 French Onion enjoyed its New World glory years in the ’60s with America’s culinary discovery of “France,” but these days, it’s generally looked on less kindly in the soup community. Basically, if you’re trying not to appear cheap on a date at a mediocre bistro, French Onion is the homie who will always be on call, but straight up, you should not forget that this is basically a bowl of onions. Like any gathering of superstars put together to win a championship, from the Heat to the Galacticos, when the chemistry is right, the results can be incredible. But when things start to go wrong, those same strong personalities can work against each other to cause a disaster. Did Star Anise refuse to practice with Lime? Were Bean Sprouts and Cilantro a negative influence in the dressing room? Did the normally rock-solid Beef Broth show up from the offseason flabby? All we know is that, when push came to shove, French Onion rode the solid soup fundamentals of Fat, Salt, and Onions to victory. Though both soups obviously hail from overseas, America’s reflexive affinity for European cuisine, plus the lack of any scary-sounding foreign words might have allowed French Onion to enjoy the implicit support of the crowd, a factor that could have rattled the confidence of the relatively inexperienced Pho. And yet, it may have been, all this time, that the seeds themselves were biased, and this was simply a case where the Soup Media was so enamored of its cosmopolitan favorite that it severely underestimated a stalwart of the soup game. Sure, it might basically be a glorified condiment, but French Onion has seen talented but unproven upstarts like Pho come and go. Did Pho crumble under the pressure of being top seed? Was America ready for a soup it wasn’t even sure how to pronounce? At the end of the day, it may be that the joke was on the seeding system that fans will be complaining bitterly about for years to come. French Onion is now a genuine contender for the inaugural crown. We ignore them at our peril. Andrew Ti is the mind behind Yo, Is This Racist? He lives in Los Angeles.